This MTP to LC fanout split into a 900um output with individual LC connectors is used to interconnect the MTP backbone connectors with LC patchcords in patchpanels. It is easy to install thanks to individual identification of each LC connector. This MTP to LC fanout split into a 900um output with individual LC connectors is used to interconnect the MTP backbone connectors with LC patchcords in patchpanels. 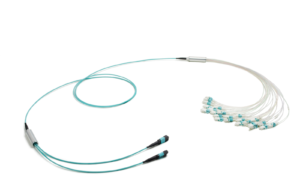 The ruggedized double jacket cable offers better protection of the fibers during deployment. It is easy to install thanks to individual identification of each LC connector. 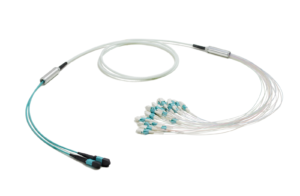 This product’s split of 2xMTP to 24 individual LC connectors combines the need for a thin and very compact cable and the need for a high bandwidth connection. 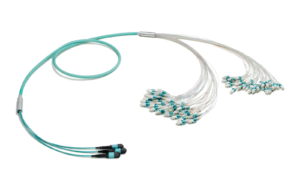 Just 3.8mm of cable contains 24-fibers, offering portable and compact cabling that creates a secure transition between the MTP backbone cabling and individual LC connectors. 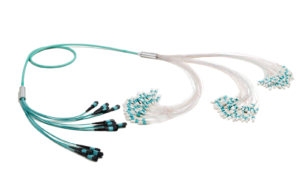 This product’s split of 4xMTP to 48 individual LC connectors combines the need for a thin and very compact cable and the need for high bandwidth connection. 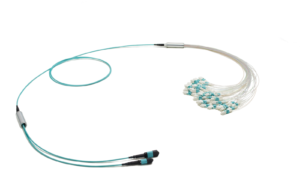 The cable has a central strengthening member, which allows the portable, compact and ruggedized cable to withstand even pulling on the assembly. 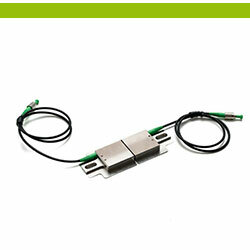 The product is an ideal solution for splitting a backbone link to a patching area. 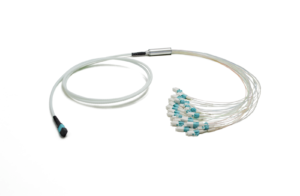 With MTP keyed connectors on one side and fiber markings on the individual LC connectors terminated on 900um tubing, it is specially designed for patching inside patchpanels. 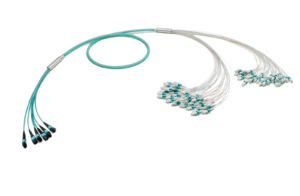 This product’s split of MTP to 24 individual LC connectors combines the need for a thin and very compact cable and the need for a high bandwidth connection. 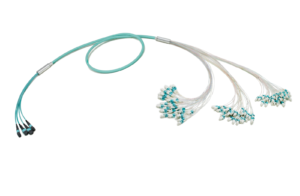 Just 3.8mm of cable contains 24-fibers, offering portable and compact cabling that creates a secure transition between the MTP backbone cabling and individual LC connectors. 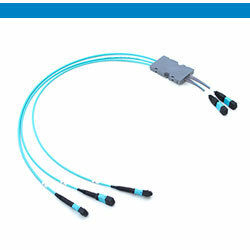 This product’s split of 2x24f MTP to 48 individual LC connectors combines the need for a thin and very compact cable and the need for high bandwidth connection. 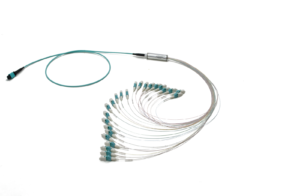 The cable has a central strengthening member, which allows the portable, compact and ruggedized cable to withstand even pulling on the assembly. 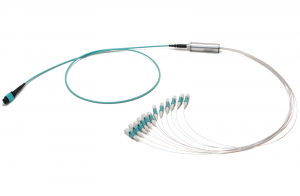 This product creates a secure transition between MTP and individual LC connectors where additional protection of the fiber is necessary. The ruggedized corrugated Miniflex tube helps withstand any possible damage to the fiber during installation. 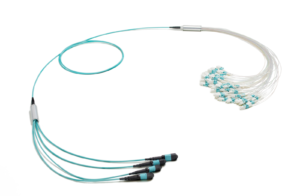 Thanks to its robustness this product doesn't need additional protection from the conduit. 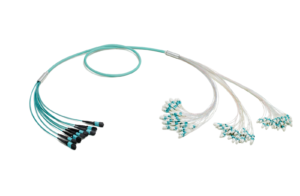 By protecting the fiber on its route from the back-bone cabling to patching area the Miniflex fanout cable ensures that even non-professional treatment of the fanout cable will not jeopardize the data interconnection. 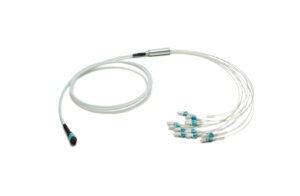 This product creates a secure transition between MTP and individual LC connectors in a thin, robust and flexible "cable". The ruggedized corrugated Miniflex tube helps withstand any possible damage to the fiber during installation. 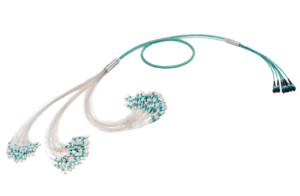 Thanks to its robustness this product doesn't need additional protection from the conduit.